Sugar Stocks – Shree Renuka Sugars, Bajaj Hindustan, Balrampur Chini — The rise and the Fall ! In the last couple of weeks i have got numerous queries on whether to buy Sugar stocks or not ! The answer is its difficult to tell when will it bounce back and its always dangerous to catch a falling knife. Although some days back i had mentioned a possibility of a 10-15% bounce in Sugars which dint happen. Luckily we did not take the trade as i could not see turnaround moves or signals in the days. The last major trade we did in Sugar was in July 2009. The move was Renuka – 120 to 180 ( which would now be 60 to 90 on bonus adjustment ) and Balrampur Chini 90 to 120. I remember it because we could not buy the intended quantity but got a quick 30-50% move in 2-3 weeks. Since then we might have had few short term trades but its been totally of the radar since last few months. 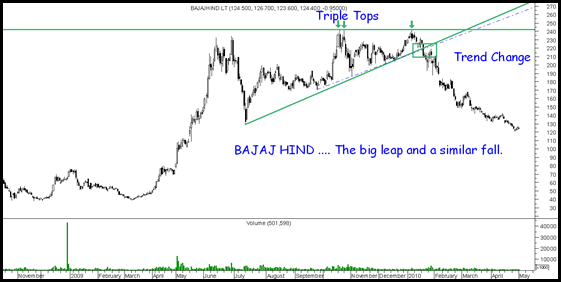 The reasons would be clear with the two charts of Renuka and Bajaj Hind showing the trend change. 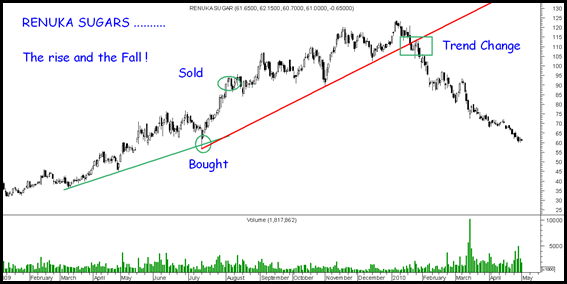 The stock gave its trend change signal way back in end of January and since then the stock has been on a one way fall. The reason should also be attributed to similar fall in Sugar prices ! The stock gave a classic Triple top and Triangle breakdown signal in end of January. Since then the stock has not given any signals of a turnaround though i am constantly on the look out. If you see all the three – Balrampur Chini , Bajaj Hind and Shree Renuka Sugars are very close to 61.8% retracement. This is not a buy recommendation but a view to be alert for a possible opportunity. Although i am generally bad at catching bounces! but there is no harm being alert. Click on the charts below to enlarge it. The sugar analysis left me too tired for anything more 🙂 and also a bit busy this week. I am also watching sugar stocks with interest, don’t hold any pure sugar plays currently though. Fundamentally and politically (sharad pawar effect 🙂 ), as well I think the sugar prices are in for a rebound and sugar stocks may give a pullback rally.